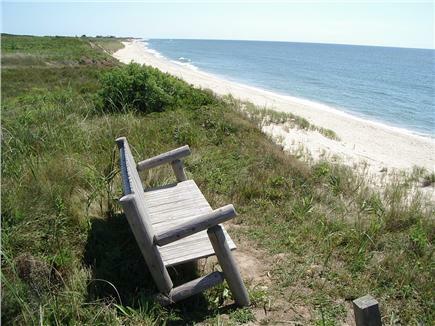 Family beach house with own steps to great swimming beach on South Shore of Nantucket. Decks with great ocean views about 200 feet from bluff. Remote location on South Shore reached by 2+ miles of easily drivable dirt road. Deck facing ocean, small deck facing moors. 4 Bedrooms, ideal for individual, couple, or family. Living room, 14x18 with cathedral ceiling and large 4-way views, 2 comfortable sofas, 4 side chairs, sliding doors to deck. Dining room and kitchen with views of ocean, sliding doors to deck, gas range, dishwasher, cherry dining table. Main bedroom, also 14x18, with cathedral ceiling, queen bed, sitting area, small bath with stall shower. Small bedroom with double bed. 2 rooms for kids (4 twin beds) upstairs, with great views. All excellent mattresses. Main bathroom with tub/shower combo redone in 2010. Outdoor shower. Linens provided. Washer/dryer in shed. Property has second house used by family only, each with unobstructed view of ocean and private deck, plenty of separation, sharing driveway and path/steps to beach. Nice pine and fir floors, colorful rugs. Charcoal Weber grill. Not a fancy home, but loved and used by same family since 1973, with bedroom and living room additions in 1980 and 1990. Additional pricing info: discounts for multiple week rentals, State and local taxes of 11.7% will apply.